First power-up and sucessful test of my 8200! I know, what is an "8200"? That is what I'm currently calling my marriage of the new 8000DLE board with my old 200D PA/Filter board. I just got to a point in the new chassis build today where I could mount both boards and interconnect them. Powered the system on and it worked! Had just one problem and that was with Alex. I Found that you can NOT run with the Alex button enabled (firmware control). You must turn it off and operate in manual mode to get the filters switching correctly. Other than that, everything seems to work fine so far. I haven't tested everything yet, obviously, but will over the coming days. More chassis work still to do to get everything connected and attached to its new home. The only thing I added was a 6db attenuator between the 8000DLE board and the 200D PA board (J3 to J2 on 200D board) to knock the 2 watt output down to 0.5 watts as it goes into the 200D board. With this installed, power trimming was very close to what it was with the original 200D transceiver board. This was a small SMA attenuator that I screwed on the 8000DLE board. All functions seem to work fine with the same connectivity as it was with the 200D originally. PureSignal (external with coupler fed into the bypass connector) works as well and a quick 2 tone test on 17m at 30 watts out showed third order IMD down about 62 db or so. This is close to what I was getting before the 8000DLE board was used so I imagine it is a function of the old 200D PA. When I'm finished with this project, I'll rename this to an "8256" depicting the marriage of the 8000DLE, the 200D, and its new home, an original Icom 756 cabinet and front panel with all knobs, switch, and buttons active and controlling the software! I purchased the donor 756 a long time ago and the display died some years later. It sat on my shelf for years until I had the idea to gut it, build a new chassis for it, and tie in the front panel functions to my Anan. I'll use an Arduino Mega to feed all the buttons and switches to and it will output CAT commands to the Anan software. One other thing. You have to tell the software you are running a 200D. Telling it you are running an 8000DLE won't work with the 200D PA/Filter board. I thought this is what was going to be required but did confirm it with testing. Lots of work left to do before the project is finished but this was a major milestone. If anyone is thinking about using the new 8000DLE board with their existing older Anan PA/Filter board, it will work; at least with a 200D rev 24 board. I suspect it will work with the older boards as well as with the 100D too. Re: First power-up and sucessful test of my 8200! I'll post some pics soon. Still finishing up the chassis. Mostly done now. I've had the system together for the last couple of days doing some final testing to see what additional changes I need to make before I call the chassis done and move on to the interface work to get the front panel tied in. I found one problem with using the 200D PA/Filter board with the new 8000DLE transceiver board yesterday when I tested PureSignal with my external coupler. I wasn't getting any signal in through the Bypass connector. Turns out the 8000DLE board apparently doesn't output Protocol Command 11 to switch K36 which is needed to connect RX1 to the Bypass port on transmit. I guess this isn't surprising since K36 (or its equivalent) is not used in the 8000DLE. I had to lift pin 7 of U10 and run a jumper from the pad that pin went to (which goes to K36) over to U5 and solder it to pin 7 there. That pin outputs Protocol Command 27 which is TXRX Relay switching. This solved the problem but would be an issue if you wanted to use the radio with the internal coupler since this now hard wires RX1 to the Bypass connector during Transmit. May be a better way to do this but it works fine this way for now. I believe everything else works with this combination although I don't use a transverter and haven't tested it. Here is a quick picture looking from the rear of my rig while it is undergoing testing after doing a mod to the PA. The 8000DLE board is in a compartment below the PA board out of sight. I designed the rear panel using Front Panel Express. Fits nicely and looks good! Almost done now with the chassis. Still need to mount a 5v and 3.3v regulator and associated wiring for the Arduino, multiplexers, display driver, and other chips that will be used to interface the front panel knobs and switches. Doing mods on the PA to eliminate the drivers since I have almost three watts now from the 8000DLE board they are not needed. Testing that mod now. I think I'm going to have to reduce the input pad attenuation to 3db from the 6db stock to get full output on all bands. Last edited by Joe-W4WT on Thu Aug 10, 2017 12:26 am, edited 3 times in total. Beautiful work on that rear panel from Front Panel Express, including silk screen and everything! If you don't mind me asking, what did FPE charge you for that? I tried the "img" tag and I couldn't get it to work. I also didn't see an image for your example above. It just says "image" on my browser; the same thing I saw when I tried it so I used the URL tag. My understanding of how it is supposed to work is you click the "img" button above and put the address to the image (which is the URL I posted as far as I know) between the two "img" tags. Is that not correct? As for the cost of the panel, it was $116.00 for that particular work. It took quite a bit of measuring to make sure it was right and in fact, I built a temporary panel and drilled it to double check it to make sure I had everything correct before doing the Front Panel Express workup. 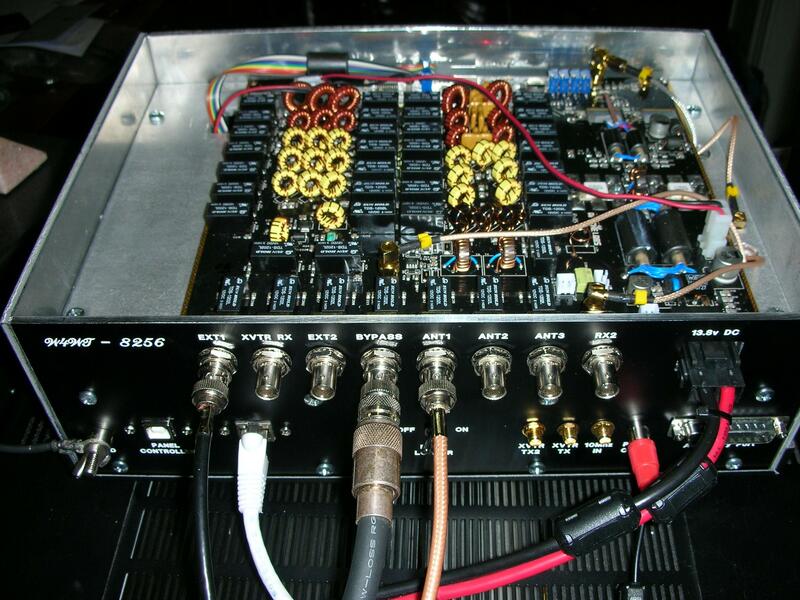 Since I used the 200D PA board by positioning it with all the connectors coming out the back of the radio, as the Anan was built, measurements had to be precise. I was holding my breath when I received it and tried fitting it to the board! I've used them before for my legal limit dual LDMOS amp and they do really nice work. Not inexpensive but real nice. I finished the PA mods and am seeing 100 watts on all bands now with the drivers removed and the 8000DLE board driving the finals directly. I see IMD in the fifties on all bands with PureSIgnal which is the best these 200D finals are going to do, I believe. Without PureSignal the IMD runs in the high twenties to low/mid thirties. Running into my dual LDMOS amp, I see most bands in the low sixties for IMD. I have a couple of mods to do to the amp that may bring all the bands up in the sixties; perhaps mid sixties. My next work on the 200D board is to replace the current 6m preamp with the amp used in the 7000; the PGA-103+ chip which is an amazing amp. I'm also going to use one of these to build a PA0RDT style all band antenna to operate from 160-6 as a diversity antenna as well as an antenna I can use the wideband function of Thetis with. Should work well. That wasn't nearly as much as I thought, especially with the silk screen. Not bad considering you only ordered a single panel. The link I put up worked yesterday, but not today. It seems the image hosting site you chose is set up to forbid linking directly to the image. You might want to consider using something more forum friendly, like Flickr or Imgur. I appear to be "snake bit" on getting an image to work. I opened an account on IMGUR and posted the image, copied the image link and edited my previous post to put the image in but I still don't see an image. I left the URL link in along with the image link. You need to use the BBCode link that you see on the Imgur page when viewing that image from within your Imgur account. The BBC code hint got me straightened out. Thanks! I made the change to the original post.